Samurzakano and Abkhazia under the Russian Empire in 1899. 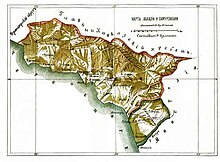 Samurzakano (Georgian: სამურზაყანო, Samurzak'ano, Samurzaqano) is a historical region in southeast part of Abkhazia, in western Georgia. Samurzakano was established as a fief of one of the branches of the Sharvashidze family at the dawn of the 18th century. It included the territory of the contemporary Gali district and part of Ochamchira district. The population is mostly Georgian (Mingrelians), with Abkhaz, Armenian, and Russian minorities. Georgian Soviet Encyclopedia, v. 9, p. 37, Tb., 1985. This page was last edited on 29 September 2014, at 18:32 (UTC).